Music is an outburst of the soul indeed! It is an ultimate therapy to our gloomy days and the right kick when we’re high on happiness. With technology, the ways of listening to music have also evolved. The world has moved on from the era of pocket mp3 players and portable Walkman to online music streaming services. When it comes to online music streaming, Spotify happens to strike our mind at the first place. By default, the free plan subscription streams music on 96 kbps quality on phone and 126 kbps on desktop. But if you’re a music freak and want some more bass and magic then you can switch to Spotify premium. With Spotify Premium, you can stream high quality audio in 320 kbps sound. So, if you want to play your Spotify tracks without switching to premium subscription, here’s a little trick! For those who worship music and don’t like to compromise on the sound quality here’s how you can stream high quality music on Spotify. Let’s discuss the methods in detail for Smartphone and desktop. Follow these quick steps to customize the audio quality on your Spotify account. Launch Spotify app on your Smartphone. Head on to “Your Library” tab and tap on the small gear icon on the right to open Settings. On iOS, select Music Quality. On Android, scroll down until you find it. Spotify basically offers 3 different types of sound quality for mobile platform ranging from normal (96 kbps), High (160 kbps) to Extreme (320kbps). On this page, you’ll find one Automatic option which adjusts the sound quality based on network connection. 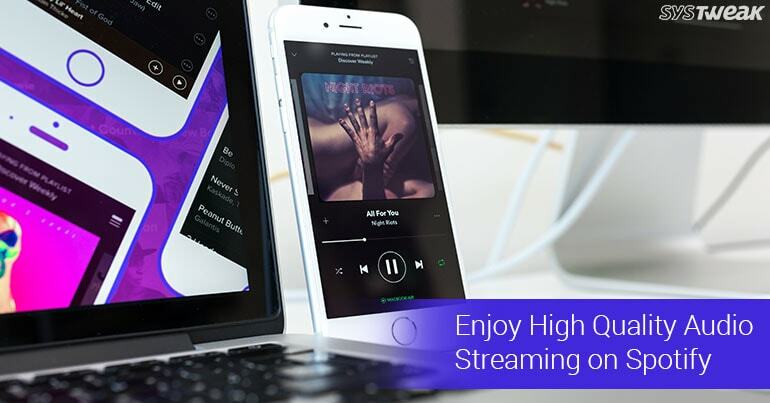 So, if you want to stream songs in high quality, simply tap on “Extreme” and enjoy high quality music on your device. P.S. Just keep in mind, choosing higher quality streaming options will consume more mobile data of your device. Launch Spotify website on your desktop and tap the down arrow next to your profile. In the Settings window, under Music quality section, toggle the high-quality streaming option. By enabling this option all your music tracks will play in high quality audio format (320kbps). If you want to test various sound quality parameters and feel the difference, you can do it via National Public Radio website. Clicking on this link will allow you to test sound quality in different formats ranging from 128kbps to 320kbps. By this you can have a fair idea how great a high-quality audio actually feels like!